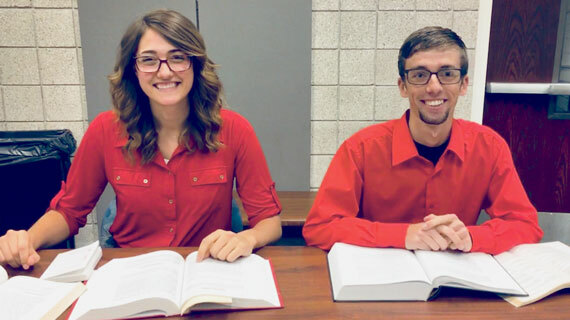 Southern Utah University graduates Elizabeth Adams and Dallas Anselmo have recently been accepted to the accredited William S. Boyd School of Law at University of Las Vegas, both on full tuition scholarships. The Boyd School of Law is a very competitive program and for its Fall 2018 school year, 883 applications were submitted, 272 applications were accepted, and only 156 students are now enrolled. SUU has been a major stepping stone in helping these students achieve their academic goals, as well as in assisting both the growth and broadening of their professional ambitions. “Both students devoted a great deal of time and energy to ensuring they performed at their best and found a school that would fit their interests and goals,” said Tyler Melling J.D., SUU legal studies coordinator. Sandy, UT native Elizabeth Adams in interested in pursuing criminal law. While at SUU, Adams conducted a research project drafting an inheritance law that would help low-income blended families. She also programmed a calculator as an aid to help attorneys interpret law; this calculator is in its final approval stages before being sent to the Utah Bar Association. Dallas Anselmo, from Price UT, is drawn to sports and entertainment law. He recently was elected in the Student Bar Association to the position of 1L Section One Representative, representing 71 of his classmates. These full-tuition merit-based scholarships were received thanks to their outstanding GPA and LSAT scores, which each student worked incredibly hard for. Both students thank SUU’s legal studies program for this milestone preparation. The only law school located in Las Vegas, the William S. Boyd School of Law is accredited by the American Bar Association. According to U.S. News, the institution ranks number one in legal writing, 10th in dispute resolution, and 51st in Best Law Schools. As 2018-2019 law school applications have increased by about 11%, it’s clear that more and more ambitious students today are dreaming of being accepted into a top law school. Luckily, SUU’s pre-law program prepares prospective law students to face these challenges and become more viable candidates. Learn more about SUU’s Undergraduate Legal Studies program or contact the advisor at legalscholars@suu.edu.